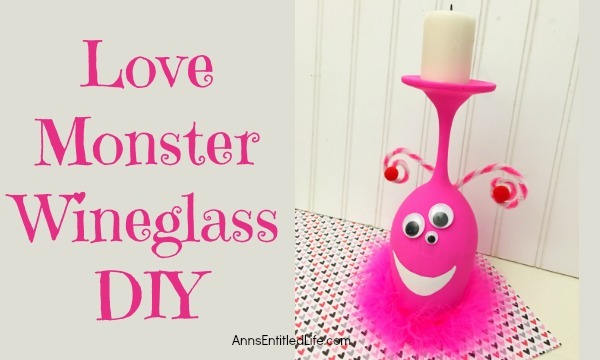 Make your own adorable Love Monster Wineglass. 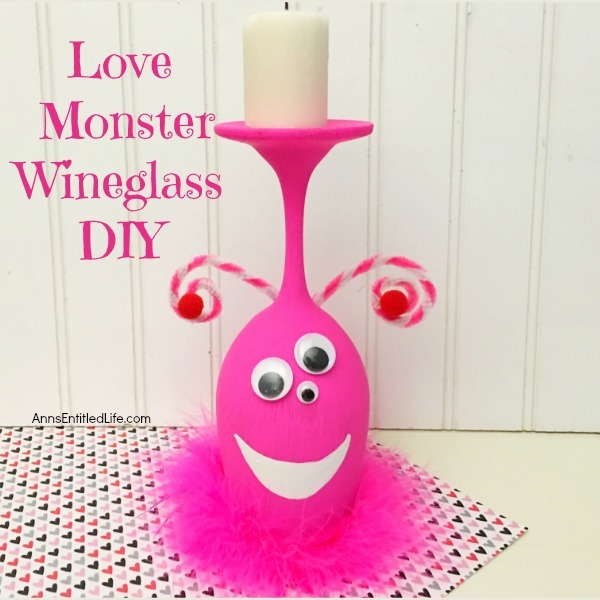 This easy step by step tutorial will show you how to easily make a cute wineglass monster which is perfect for a centerpiece, mantel decor or table decorations on Valentine’s Day or Halloween! If you are looking for an adorable craft project, this is it! This love monster wineglass was made with pink for Valentine’s Day. 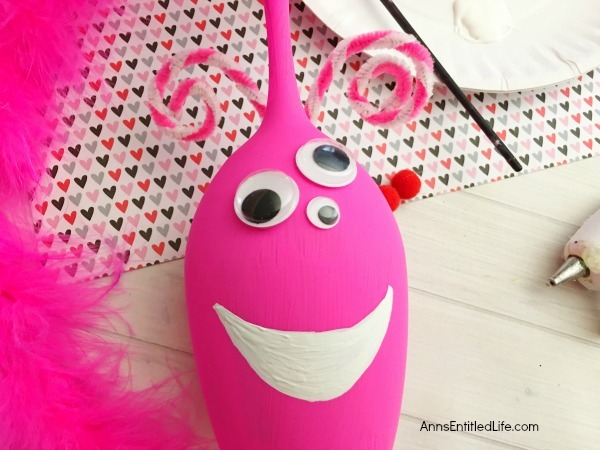 Simply make the color bright purple, orange, or green and you are an adorable craft for Halloween – you can also leave it pink, or mix and match the colors for a great centerpiece, mantel decor or table decoration look! 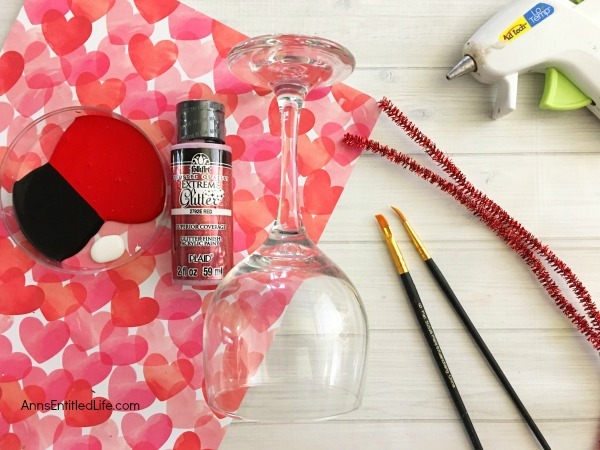 I simply adore painted wine glass decor, as you can see by the Love Bug Wineglass DIY (Valentine’s Day or Summer decor), Turkey Wine Glass DIY (Thanksgiving or Fall), DIY Wine Glass Snowman (Christmas or Winter), DIY Wine Glass Witch (Halloween) and the DIY Pineapple Candle Holder (anytime!) crafts I have shared in the past. But the truth is, these painted wine glass crafts are simple to make, fun, and are finished in no time flat. Truly just about any adult can make them. 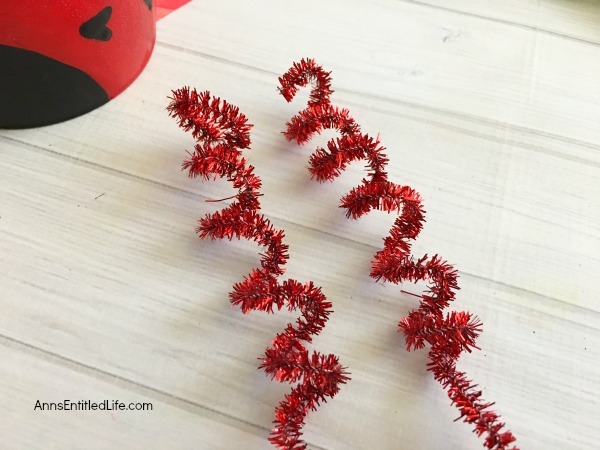 • Wrap one end of the twisted pipe cleaner around your finger to twirl the end, twist the bottoms together (this will be hot glued to the back of your wine glass). 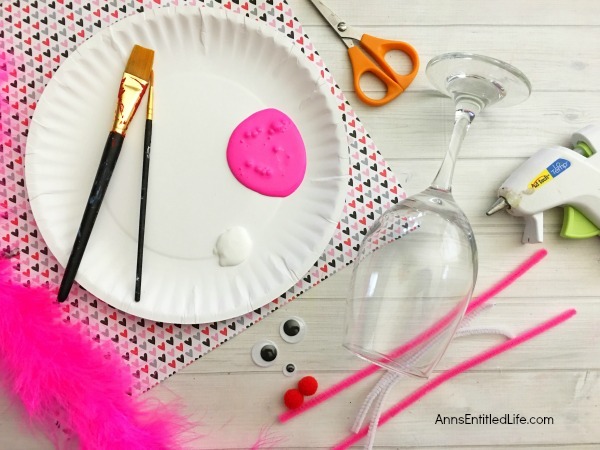 • Paint the inside of your wineglass bright pink with your paintbrush (you can use a foam paintbrush). 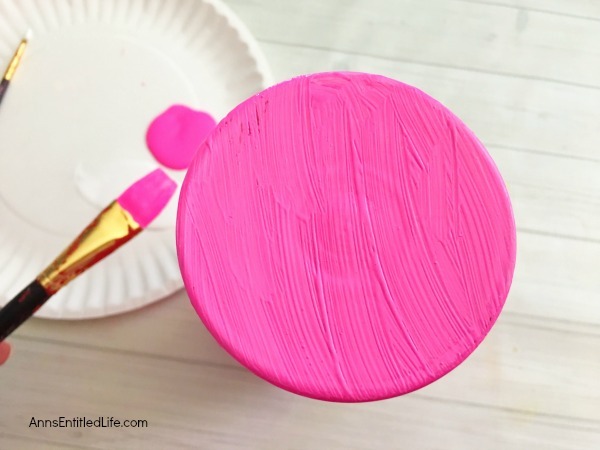 • Paint the outside of your wineglass bright pink with your paintbrush (you can use a foam paintbrush). • Turn your glass upside down and paint a large white smile onto the bowl of the glass towards the bottom, just make sure to leave room for the fluffy boa. 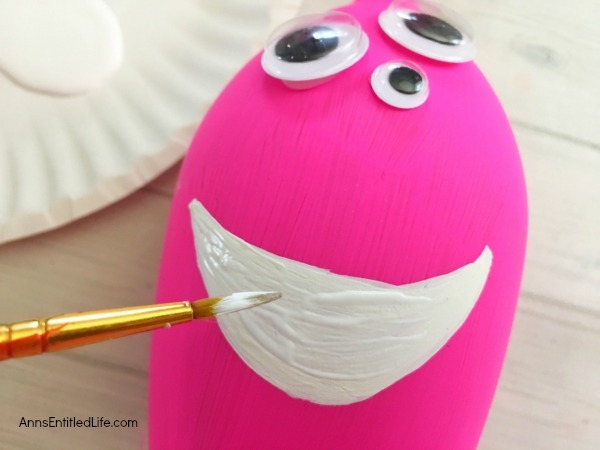 • Glue 3 different size googly eyes above the mouth. 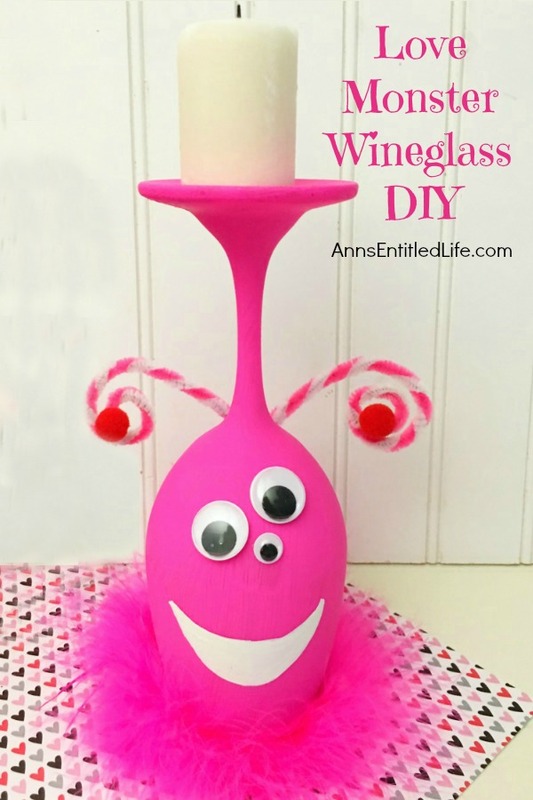 • Hot glue your pink and white pipe cleaner to each side of the back of the wineglass to form antennas. 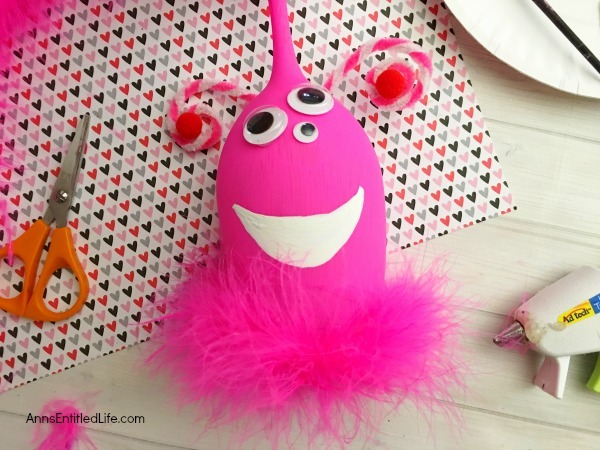 • To finish your love monster hot glue a pink boa around the bottom of your wine glass and cut off any excess boa. • Top off with a tea light candle for looks only! If you want to use a flameless tea light for this one to imitate a flame, that would look super cute! Between the pipe cleaners and fluffy boa, and an open flame is strongly discouraged! • Set this cute little wine glass in the middle of your table, on your fireplace mantel or an end table for a great Valentine or Haloween decoration! Make a group of three in the same or in staggered height for a sweet little centerpiece. • To print the Love Monster Wineglass DIY Instructions, click here. 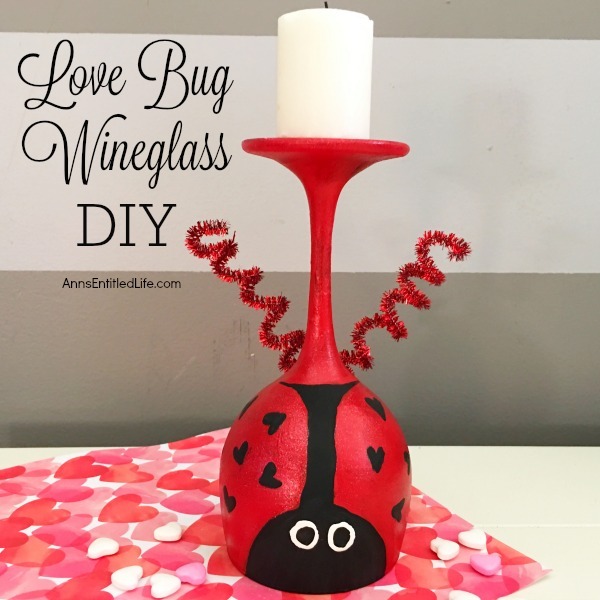 Make your own adorable Love Bug Wineglass. 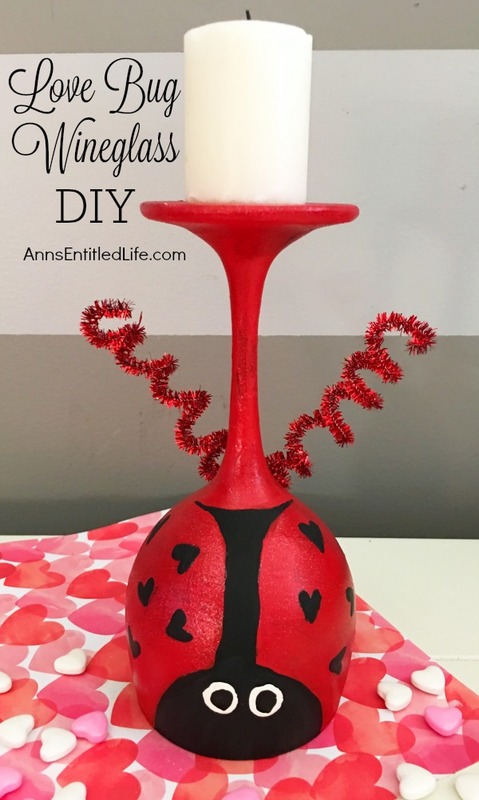 This easy step by step tutorial will show you how to easily make a wine glass love bug which is perfect for a centerpiece, mantel decor or table decorations this Valentine’s Day, or for a wonderful spring or summer craft! If you are looking for an adorable craft project, this is it! This love bug wine glass was made with hearts for Valentine’s Day. Simply make the circles instead of hearts and you can use this sweet wine glass decoration as spring or summer decor! They can go just about anywhere… round out your centerpiece (or make them the focus of your centerpiece), on a mantel, large window ledge, side table, etc. 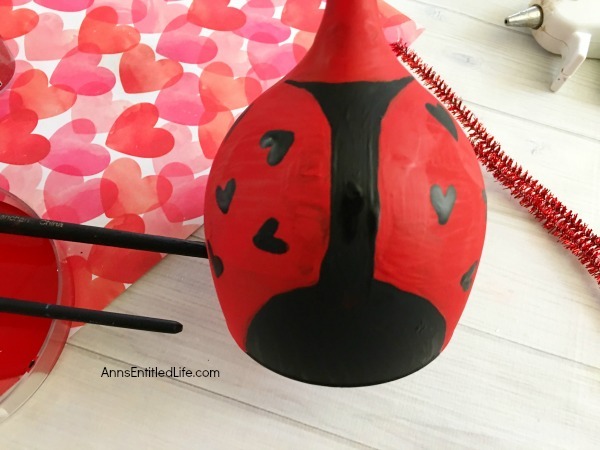 These love bug glasses can be customized for a holiday (such as Valentine’s Day), a season (such as spring or summer decor), or out year-round. 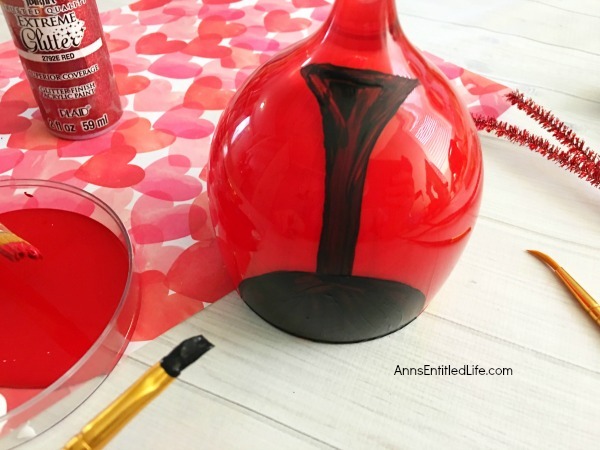 I simply adore painted wine glass decor, as evidenced by the Turkey Wine Glass DIY, DIY Wine Glass Snowman, DIY Wine Glass Witch and the DIY Pineapple Candle Holder crafts I have shared in the past. But the truth is, these painted wine glass crafts are simple to make, fun, and are finished in no time flat. Truly just about any adult can make them. So, if you are looking for a fun Valentine’s Day or Spring/Summer craft to make, give these cuties a try! You can make one, three or one for everyone at your table! 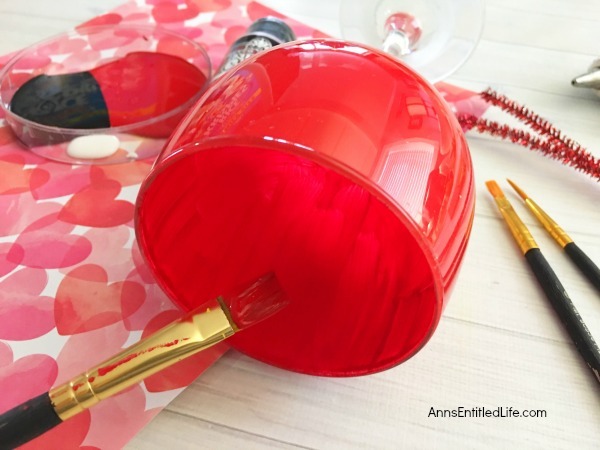 • Paint the inside of your wineglass red with your paintbrush (you can use a foam paintbrush). 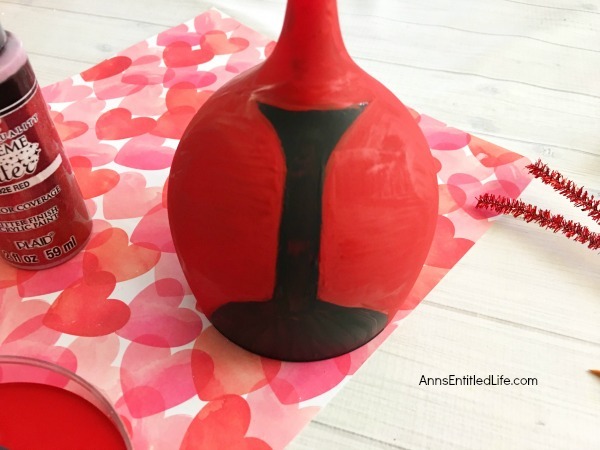 • Turn your glass upside down and paint a black stripe down the bowl of the glass with a small triangle shape on the top and the bottom half a larger oval to be the ladybug’s face. • Once the black paint is dry, paint the rest of the wine glass red. • Once the red paint is dry, paint a second coat with red glitter paint. • Paint small black hearts on each side of the glass with a small paint brush. • Paint two small white dots onto the bottom black oval. • Paint two black dots onto the white circles to give depth to the eyes. 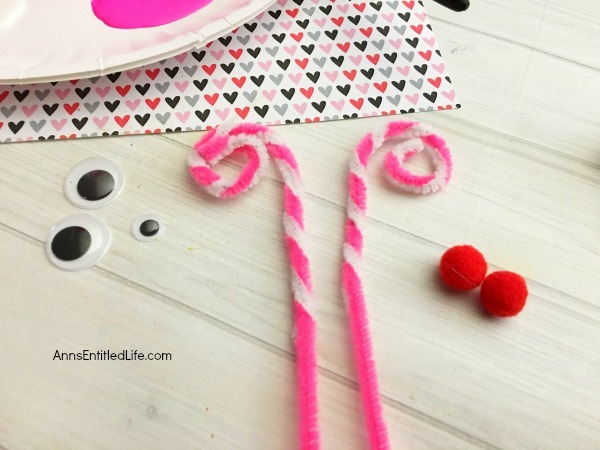 • Wrap your pipe cleaners around one of the paint brushes or a pencil to form spirals. • Hot glue one on the back of each side of the glass to make antennas. 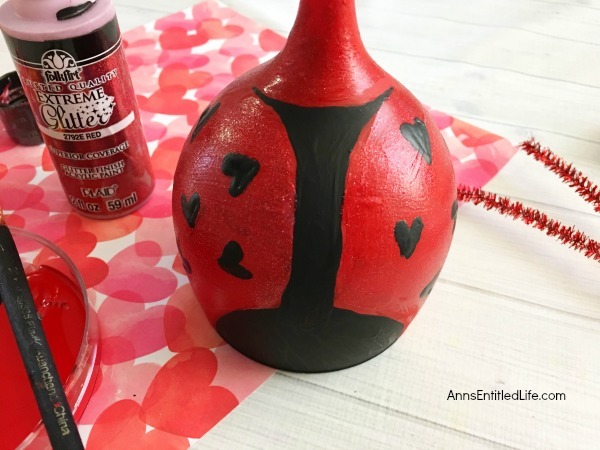 • Top off with a tea light candle (flameless may be best due to the pipe cleaners) and set this cute little wine glass in the middle of your table, on your fireplace mantel or an end table for a great Valentine or Sping or Summer decoration! Make a group of three in the same or in staggered height and set the trio among hearts and flowers for a sweet centerpiece. 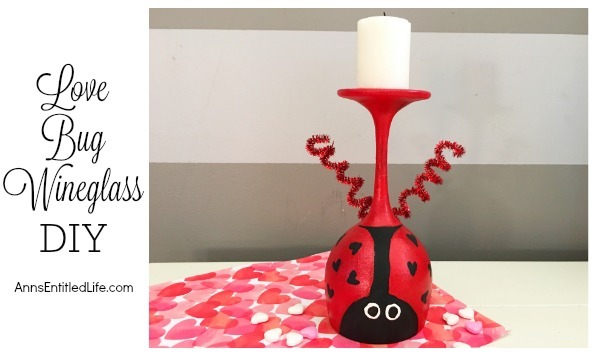 • To print the Love Bug Wineglass DIY Instructions, click here. 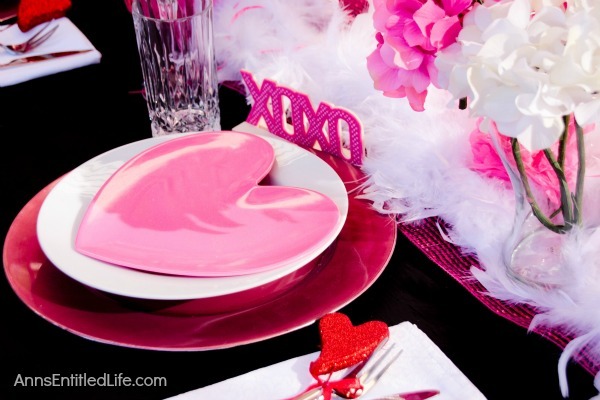 Hosting a Valentine’s Day Dinner? Dressing up the table for Valentine’s Day? 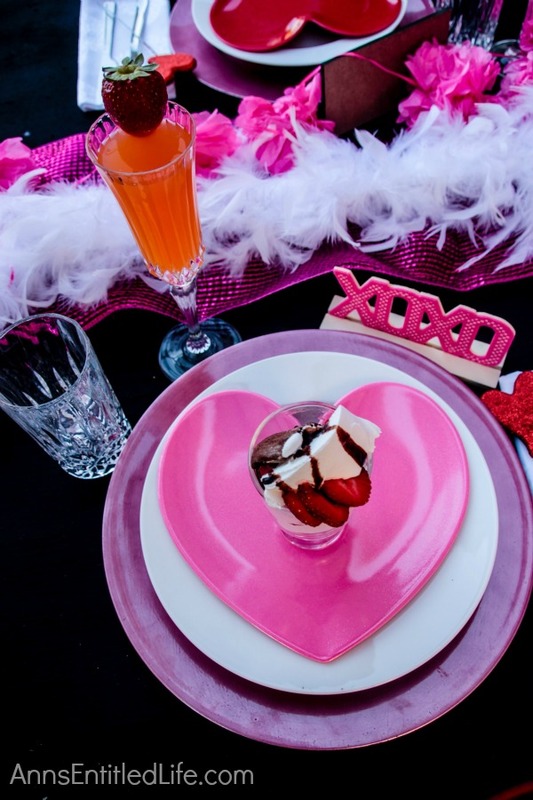 This beautiful Valentine holiday tablescape features white, red and pink. A lovely bold theme to compliment your delicious dinner. It’s hard to believe Valentine’s Day is almost here. Instead of spending a lot of money on Valentine’s Day, why not celebrate at home with your special someone or special someones! The kids loved to be included in holidays. 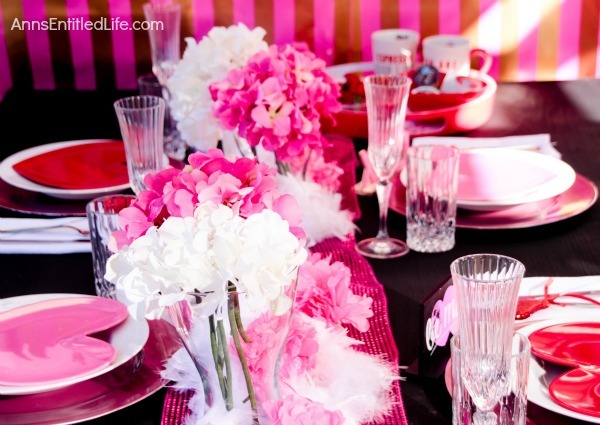 Another idea is to have invited a few couples over and have a Valentine’s Day dinner party. 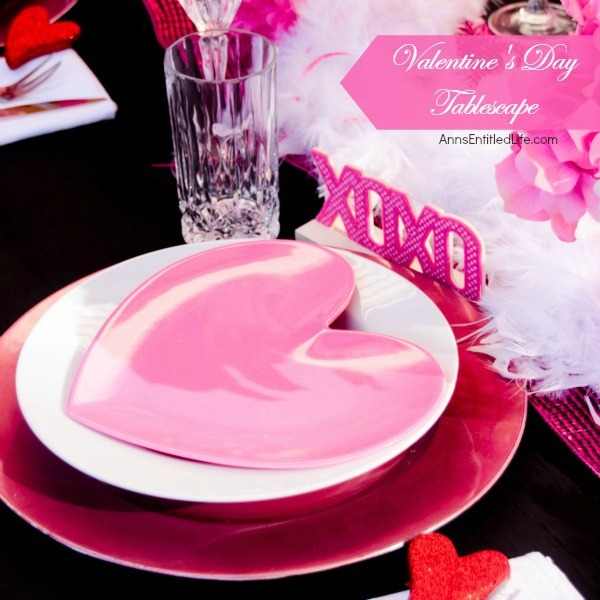 If you are looking for table decoration ideas for a special Valentine Day dinner, lunch or party, check out this Valentine’s Day Tablescape idea. • Start with a black or white table cloth. You are layering pink and red, so the dark or white will help the pink and red “pop”! • Instead of a traditional table runner, lay the center of the table with 2 White (or pink or red) Feather Boas stretched across the table. • Place Pink Paper Tissue Flower garlands alongside the Boas. • Place the Vases with Hydrangeas towards the center of the table. • Place down Pink Chargers, top with a white plate. 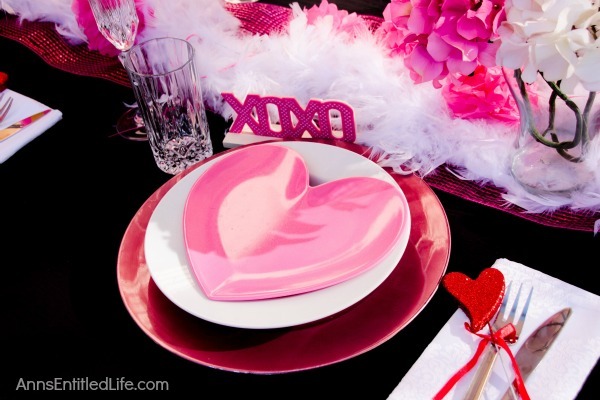 • Place the heart-shaped plates directly on top of the white plates. • Place silverware and napkins to the right of the plates. • Place a set of glasses to the left of each table setting. 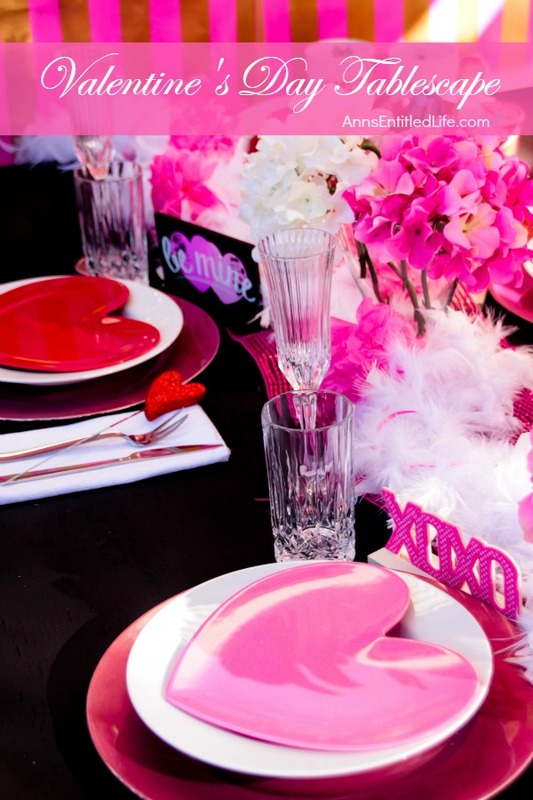 • Place assorted Valentine Decor around the table. The “Be Mine” and “XOXO” signs are from the dollar section of Target!